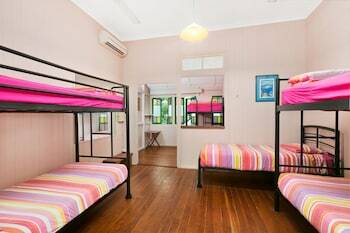 When you stay at Dreamtime Travellers Rest Hostel in Parramatta Park, you'll be in the historical district, within a 15-minute drive of Centenary Lakes Botanic Gardens and Mount Whitfield Conservation Park. Featured amenities include complimentary wired Internet access, luggage storage, and laundry facilities. A roundtrip airport shuttle is provided for a surcharge at scheduled times, and free self parking is available onsite. Located in Arthurs Seat, Anderida is within a 15-minute drive of Paringa Estate and Heronswood Garden. Free self parking is available onsite. When you stay at Palm Court Noosa in Noosa Heads, you'll be near the beach, within a 15-minute walk of Noosa Beach and Hastings Street. Free self parking is available onsite. Located in Kia Ora, this apartment is within a 10-minute drive of Billabong Native Garden and Gloucester Folk Museum. Free self parking is available onsite. With a stay at this apartment in Melbourne (Chinatown), you'll be minutes from Her Majesty's Theatre and Bourke Street Mall. Free self parking is available onsite.